IMO 1 of the best race weekends of the year! Also expecting drivers like Checo to announce his drive for 2019 this week! The hypersofts! Haven't seen them for a while. 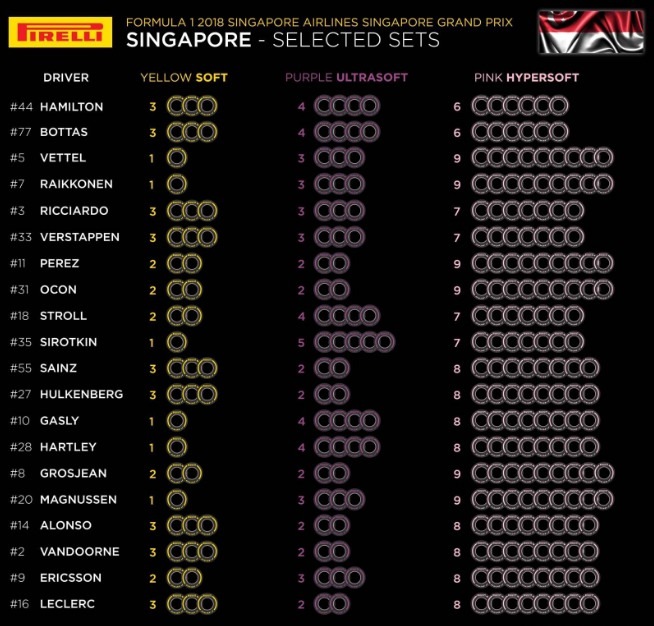 Only one set of softs each for Ferrari, have they made the same mistake as in Monza? No one is going to use that tyre in the race really. It's like using the white striped tyre when the red and yellow striped are available. Last edited by Rockie on Mon Sep 10, 2018 6:59 pm, edited 1 time in total. It's been mooted, here's hoping. No rain forecast for Friday, Saturday or Sunday. It's like using the white striped tyre when the res and yellow stripped are available. Hasn't it been discussed on this forum that the hardest of the tyres available generally does get used in the race this year? Edit - yes it has. Below is from the Hard, Medium and Soft thread. The hardest compound is the most used compound over the season. So actually the hardest option is generally the compound favoured most during a race. And by some distance too. Yeah, that was my thinking. Not much wiggle room for strategy adjustments. I think scattered thunderstorms are looking more likely the closer we get. All the races the hypersoft has been used no one competitive has used the hardest compound. Be that as it may, if you have a first lap shunt, you may want to put on the hardest available compound to make a run all the way to the end of the race. I would like to at least have two sets of those harder compounds. One set to test during free practice and one set for the race. It's about preserving your options for unforeseen events rather than optimum pre-planned race strategy. The track layout has had a minor tweak ahead of the race weekend. This happened due to construction work being carried on around the track. Hence, the overall track length will be be 2 meters shorter but the total no. of laps (61) won't be changed. Yes, thunderstorms. Mere 'rain' very unlikely. Periods of 'cats and dogs' or 'bucketing down' extremely likely. When it was it does come it can mean stopping the race until clear but leaving a wet track. Not for the top teams. Every single year we have had them say the the rain might come during an evening session, last year was the only time it delivered to my memory. I think it basically rains every single day in Singapore at this time of year buts its usually in the mid afternoon and by the time qualifying/race starts its already completely dry due to the heat there. - Sebastian Vettel is the record holder for most Singapore GP wins and poles (4 each), and has led the most laps in Marina Bay history (221). Vettel led the Singapore GP from start-to-finish in 2011, 2013 and 2015, with the 2013 race being a grand slam victory (led every lap from pole with fastest lap). - Monza pole-sitter Kimi Raikkonen has never qualified on the front row in eight previous visits to Singapore, and has only outqualified a team mate twice here (2009, 2016). - Daniel Ricciardo has finished on the podium at Singapore in all four of his previous visits with Red Bull – the only circuit on which he has achieved this – although he has never won at Marina Bay and he’s only ever led one lap here (in 2014). - Pole position is vitally important here. 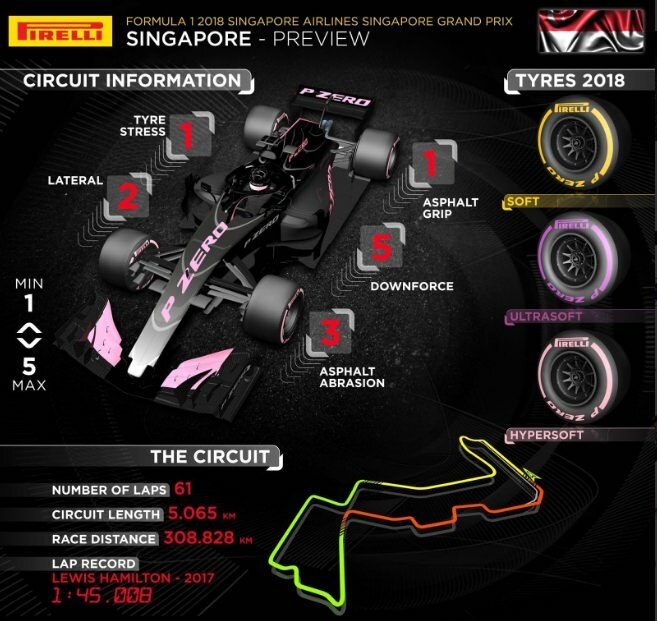 In the last nine Singapore GPs the pole-sitter has won seven times, with the exceptions being 2012, when Lewis Hamilton’s McLaren broke down while he was leading the race from pole, and 2017, when Sebastian Vettel was hit within 150 metres of the start. - The Safety Car has appeared in every Marina Bay F1 race ever held, with 12 laps of Safety Car running last season (more than 20% of the entire race). Furthermore, Lap 1 accidents have caused a Safety Car deployment in each of the last two years. Safety cars or virtual safety cars will be Mercedes' best chance here. I think they need to try to go long for the first stint and not stop until the safety cars factor in. A VSC can completely change the outcome here and overtaking here is unbelievably hard. I agree with you sandman that it is Mercedes best chance but I wonder how many of those safety cars have been on the first lap. Out of interest what strategy could you use to benefit from a lap 1 safety car? Possibly do Q2 on the softest tyre available then hope to switch to the hardest on the first lap for a 1 stopper? 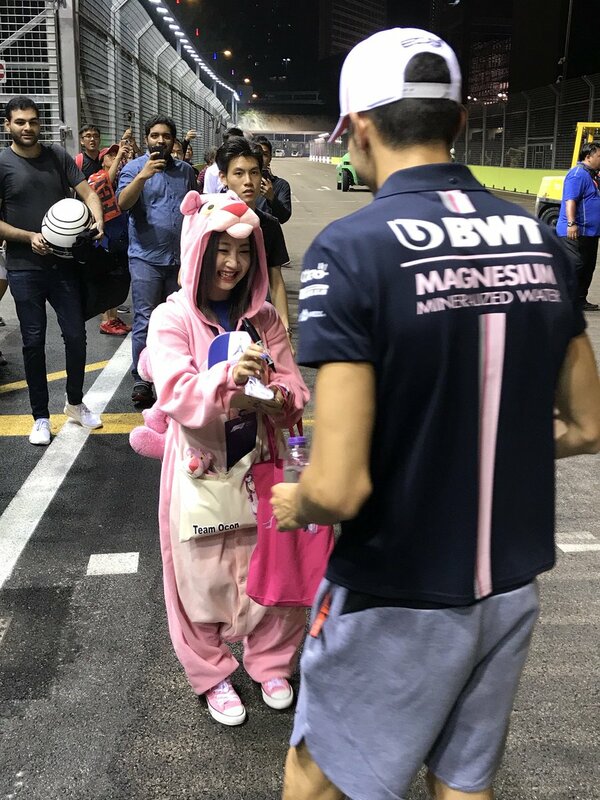 Either Ocon has got a lot of fans due to his pleasant personality or they pity him for possibly not being on the grid next year. I have always wished the F1 powers would shorten this race by 5-6 laps. At Hamilton's fast lap pace last year, 61 laps takes a full 110 minutes. And of course, the 1/2 half of the race on fuller tanks means the lap times are longer. So, the race always runs afoul of the 2-hour time limit. Add any rain or the inevitable safety car, and it almost always becomes a timed race. So Vandoorne is trying out a new floor and they change it during FP1 causing him to miss just about all of the session, I'm baffled. In the end, he had to pit as the car suffered from hydraulic issues! They are far removed from what they once were. It's abit quiet in here today, Hamilton been locking up a few times, Vettel has hit the wall and losing liquid. The Red Bulls really do look to have fallen off the pace now and the Merc and Ferarri look pretty close, closer then I and many others suspected maybe. And when will commentators learn, no sooner had Coft crowned Vettel king of Singapore than he bumped a wall. Hamilton has locked up two different sets of HS but the second set didn't look to bad. Vettel looks like he has a radiator problem and has got out the car, seemed to be taking the most risks with the walls. I think Red bull did there faster runs on the second flying lap but I did expect them to be closer. Supposedly Redbull has stopped developing this year’s car as they are focusing on next year’s car already. Merc (Hamilton) don’t look too bad here. So far they are only slower than Ferrari in s1. But we all know that may change tomorrow. Not ideal for Vettel to sit out the long runs. Another costly error? And Kimi seems ahead of him this weekend again. So already on the back foot here. Looks like the top cars will start on the US. I predict that Bottas will be used as a massive roadblock in this race. Looks like the form book may have changed here. Red Bull not so strong, Mercedes not so weak. Even if Red Bull are a little weak, they could be contention nonetheless as a safety car intrusion is a surety here.